Do you wish there was an easier way to share images to your social networks? 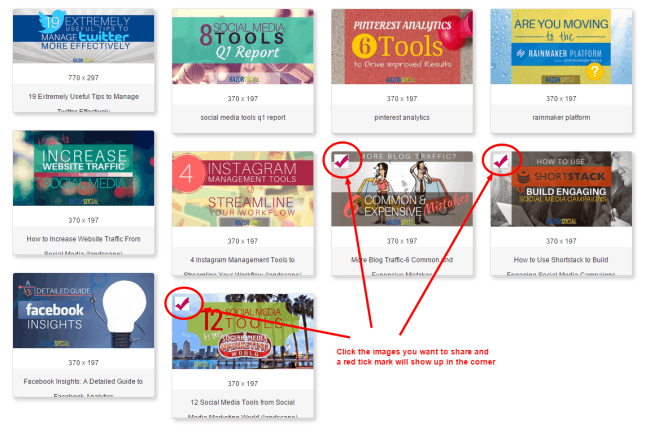 Do you want to make more of your visual content? So… do you want to be part of the image revolution on social media? 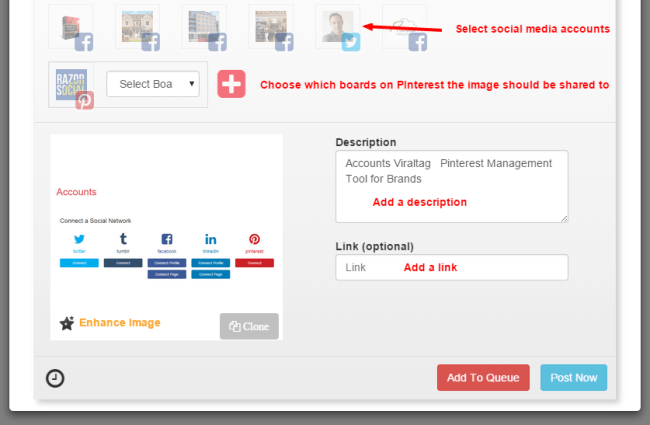 If you do, you are probably looking for an efficient way to manage your image posts on the various social networks. Each network manages its image sharing differently. This can make it a dull task to do on a regular basis! Viraltag is a tool that allows you to promote your visual content to five different social media sites, using one single interface. 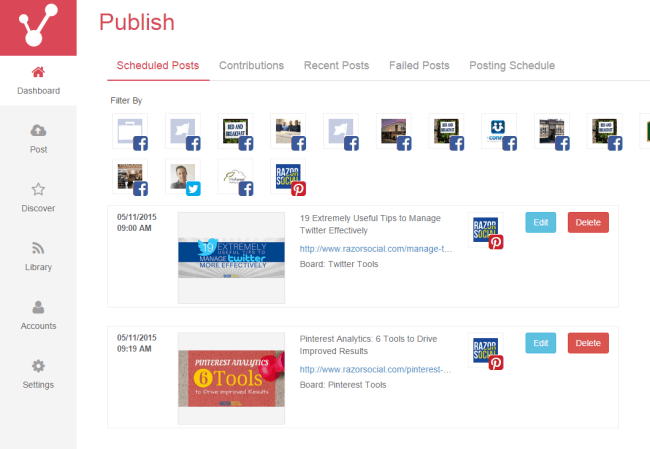 It allows you to schedule your image sharing so that you can plan your postings in advance. This means you don’t always have to be online when you want image posts to be shared. Viraltag is a site that lets users share and schedule images in their social media posts. It supports sharing to Pinterest, Twitter, Facebook (Pages and personal profiles), Tumblr and LinkedIn (profiles and pages). When you join Viraltag, you start by choosing the plan you want and connecting your accounts. Different plans allow for different numbers of networks. There is also a free plan, with limited postings and limited connected accounts. When you connect your Pinterest account, you may initially need to ‘request access’ so the site can protect itself against spammers. This means you might not be able to get started immediately, but the request doesn’t take long to be approved. One of the best things about Viraltag is that there are loads of ways to add images to share to your social media accounts. 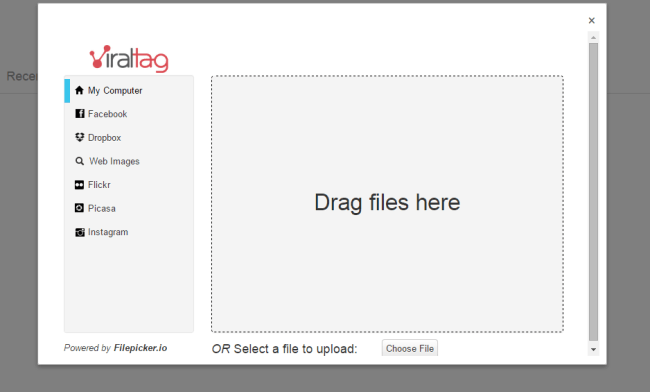 Viraltag has Extensions that Chrome and Safari users can download, and a bookmarklet for users of other browsers. The extensions need to be downloaded and installed. The bookmarklet should be dragged and dropped into your bookmarks bar. Then, whenever you see an image you’d like to share, you click the extension or the bookmarklet. Next, you will see a pop-up with all the images from the webpage you are looking at. Click on every image you want to share, and you will see a red tick mark in the top left-hand corner. If you want to share images from elsewhere, there are plenty of options on the site, under the ‘Post’ tab on the left of the screen. Instagram: access images you’ve posted on Instagram. Using the web image search as an example, here, we searched for social media icons. You can click on any of the images in the results – you can see the tick mark where we clicked the social media icon house on the top right. When you’ve chosen all the ones you need, you click ‘Upload’ on the bottom right. 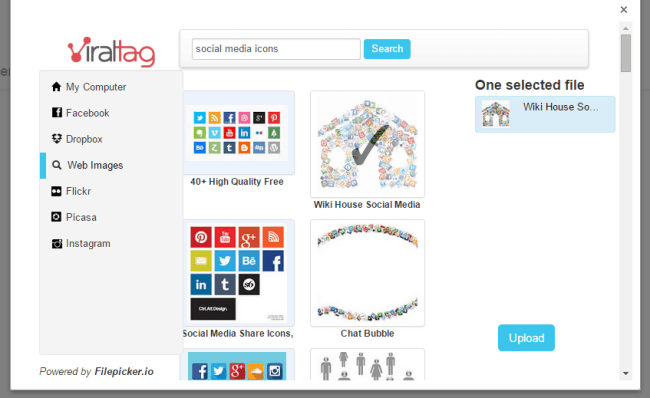 Next, Viraltag lets you choose which of your connected accounts the image should be shared to. If you choose Pinterest, you choose which board the image should be sent to. Fill in a suitable image description and add a relevant backlink. 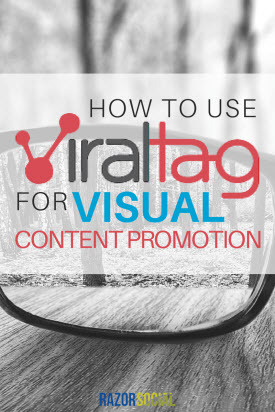 If you’re not 100% happy with the images you are about to share, you can even use Viraltag to edit them. 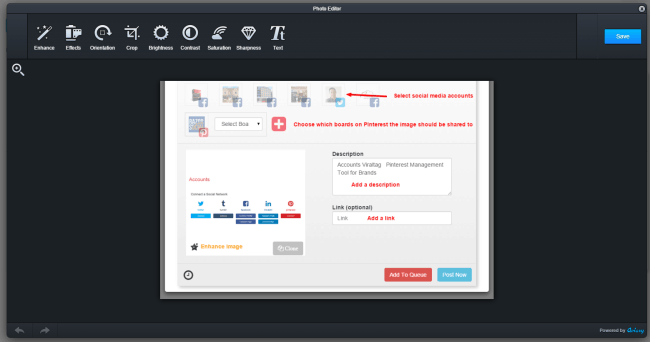 A photo editor will then appear on the page so you can make adjustments to brightness and contrast, saturation and sharpness, add text, crop the image or add effects. There are three key ways of choosing when your images will be shared. If you are dealing with two or more images, you can choose what time the first image should be shared, and how many minutes should pass until the next one is posted. So, with option 3, you start with the box titled ‘Start time’. Click in this box and choose the date and time the first image should be posted. Next, choose how many minutes should pass before the next one is posted. So, if you want an hour between posts, type 60. If you want three hours, type 180. If you’ve run out of ideas, the ‘Discover’ tab on the left in Viraltag allows you to find images according to categories, or by searching for keywords. This is especially interesting because it’s images that other users have shared. The way the images are presented looks quite like the Pinterest layout, but these images can be shared on any of your Viraltag sites, not just Pinterest. You share these images in the same way as other images on Viraltag. Click the ones you want to use, then follow the walk-through, filling out a description and link. The ‘Library’ tab in Viraltag gives you a quick and easy way to access images from your Instagram and Canva accounts. You simply connect these accounts to Viraltag and it will automatically pull in new images. 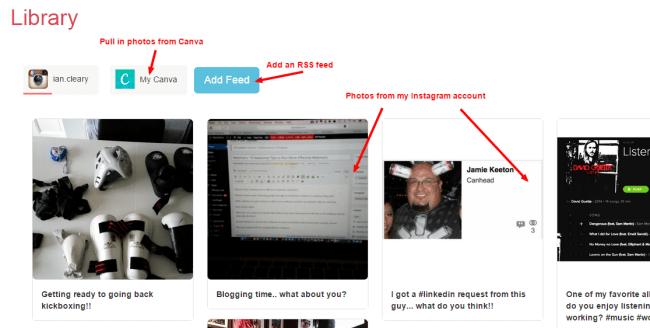 You can also add an RSS feed so that every new post from your blog (or somebody else’s!) will be readily available for you to add to your social media queues. Viraltag’s ‘Dashboard’ lets you take control of your account and keep an eye on your activity. You can see the posts that are scheduled to go out, your recent posts and any posts that have failed. This is where you can also control the times your images will go out. Currently, we are set up to share 25 images a day. For each day of the week, you can set your own times so that the image posts are shared when your followers are likely to see them. Alternatively, you can just leave it at the default settings chosen by Viraltag. Don’t forget to make sure it’s set to the correct time zone, too! 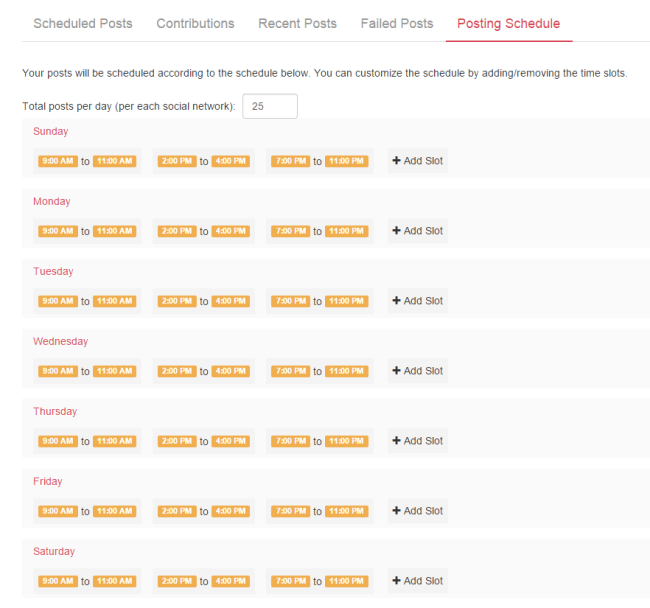 As you have seen, Viraltag is a really useful tool for scheduling and planning image posts on social media. We don’t want to post to LinkedIn on the same frequency as we post to Twitter. At the moment, it’s not possible to have a different schedule for each network, so we’d love to see that in the future. I know, we always want analytics! But, if we were going to start using Viraltag to manage the majority of our social media scheduling, we’d want some analytics so that we could see the most – and least – successful posts. As more and more brands look to Instagram for image-based marketing, it would be great if Viraltag added the ability to share and schedule posts directly to Instagram. When a post is popular, we would love to be able to re-add it to our Viraltag queue automatically, like the ‘re-Buffer’ feature in Buffer Analytics. What do you think? Are you impressed by what Viraltag can do? As always, we love to hear from you in the comments!